Hamilton’s Good Food Box Network offers nutritious fruits and vegetables at an affordable price making healthy food accessible to everybody. The program includes two options: the original Good Food Box and the new Hamilton Eat Local box, which is geared to workplaces and provides food sourced from local and Ontario farmers is being tested at pilot sites in our city. The basic box is only 15.00 and includes roughly 11 nutritionally diverse items worth 25.00 or more. Because we work directly with a local wholesaler, Market Fresh Produce, the food is shipped out the day it is delivered, to maximize freshness! 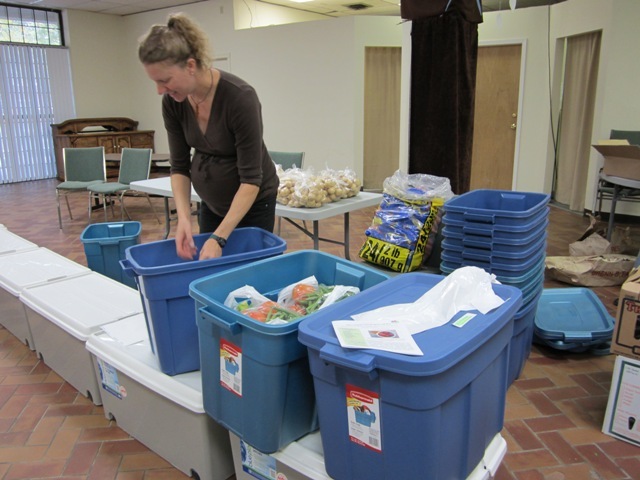 The Good Food Box packing sessions now exceeds 400 in one month. With new distribution sites opening up across Hamilton every month, the program is scaling up and will grow even more since it is becoming convenient to pick up your box in most parts of the city. Our central distribution site is located at a space provided by the Hughson Street Baptist Church in the North End. Here, a small army of eager volunteers works feverishly to sort, divide and deliver the month’s produce. This is no simple task when you're working with a mountain a delicate fresh food! The Good Food Boxes are then delivered to each local distribution site where they are picked up by everyone who placed an order. You need to be a member of Hamilton Good Food Box to add comments! Good Food Box is moving on up! Our popular Good Food Box program has been steadily growing and it's popularity increasing as more folks are spending $15 once a month and receiving a big bag full of fresh produce, shipped to community pick-up sites in bins of two. The number of pickup sites, where people pre-pay for their box and pick up is also increasing. We are also introducing a "local only" box that features Ontario produce, called the Hamilton Eat Local Box (aka The HELo Box). Today, was a day of and "hellos" and "see you soons" at the end of the volunteer-driven Good Food Box packing day. We said a gentle farewell (only temporarily) to our beloved Crystle, who has been in charge of communication for the Good Food Box as well as being our Pack-site Coordinator Extraordinaire. Crystle is leaving us for a brief time to go on maternity leave. And we said hello to our brand new-to-us conveyor to make packing and shipping our boxes easier! Well, perhaps this second update is more thrilling for us and our team of volunteers but we are so happy that we wanted to share the news. We had this system, seen above, we would line up large plastic totes with wheels and place bins (that held Good Food Boxes) on top. We would then wheel the large gray totes up the line where volunteers would add items to each Good Food Box. It worked, up to a point -- but then wheels started to come off and we began to dream of a conveyor belt. This month, for our pack in October, we finally used our new conveyor for the first time. And we are delighted. This helps us move the boxes much more efficiently and means there is less bending for our volunteers too. Hamilton Community Foundation and the Healthy Community Fund These funders are key to our growing success. And of course, our volunteers. We have a whole team of dedicated volunteers that help us and we cannot thank them enough!